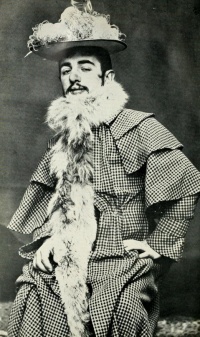 The 1890s were sometimes referred to as the "Mauve Decade," because William Henry Perkin's aniline dye allowed the widespread use of that colour in fashion, and also as the "Gay Nineties", under the then-current usage of the word "gay" which referred simply to merriment and frivolity, with no connotation of homosexuality as in present-day usage. The phrase, "The Gay Nineties," was not coined until 1926. Settlement movement based on Jane Addams' Hull House in Chicago. Hale Johnson was a major leader of the temperance movement. Department of Scientific Temperance Instruction, under Mary Hunt, achieved de facto control over all alcohol education in the USA. 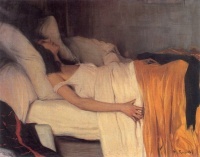 The Fin de Siècle (primarily in Paris and Brussels). Oscar Wilde published The Picture of Dorian Gray in 1890. Sir Arthur Conan Doyle published the first Sherlock Holmes in Strand Magazine in 1891. Frank Wedekind releases Spring Awakening in 1891. Thomas Hardy published Tess of the d'Urbervilles in 1891. Rudyard Kipling published Barrack-Room Ballads in 1892. Charlotte Perkins Gilman published The Yellow Wallpaper in 1892. Rudyard Kipling published The Jungle Book in 1894. George H. Thomas published in 1894 the first illustrated song for The Little Lost Child. H. G. Wells published The Time Machine (1895), The Island of Doctor Moreau (1896), and The War of the Worlds (1898). H. G. Wells created modern science fiction with his book The War of the Worlds. A. E. Housman published A Shropshire Lad in 1896. Bram Stoker published Dracula in 1897. Anton Chekhov published Uncle Vanya in 1899. Kate Chopin published The Awakening in 1899. Joseph Conrad published Heart of Darkness in 1899. Increasing importance of Art Nouveau style. For the first time in history, a coronation is filmed. The coronation is of Tsar Nicholas II of Russia. Unless indicated otherwise, the text in this article is either based on Wikipedia article "1890s" or another language Wikipedia page thereof used under the terms of the GNU Free Documentation License; or on original research by Jahsonic and friends. See Art and Popular Culture's copyright notice. This page was last modified 07:43, 5 February 2015.